TICO Alliance - Moving UHDTV 4K & 8K with TICO Compression Technology, Today. TICO Alliance - Moving UHD/4K with TICO Compression Technology, Today. The TICO Alliance and its members are committed to establishing TICO compressed video as a sustainable alternative to uncompressed with the ultimate goal to make the broadcast industry stronger and more competitive. By promoting the use of TICO as THE standard for compressed video over IP and a cost-effective alternative to uncompressed streams, broadcasters have a real chance to gain long-term infrastructure savings. All while maintaining interoperability and keeping established quality standards. Become part of the TICO Alliance to help direct the future of the broadcast and media industry. By supporting the widespread acceptance and deployment of TICO and following the SMPTE/VSF roadmap, broadcasters and suppliers can feel comfortable implementing live-production-optimized compression solutions today and avoid interoperability headaches. The consortium consisting of the industry’s top engineers, technologists and visionaries is involved in the evolution of TICO in the media & production ecosystem, thereby also providing and gaining collective input from important industry bodies such as the IETF, SMPTE, VSF, EBU and JPEG. A membership is a unique opportunity to foster contact to like-minded potential business partners and suppliers. Additionally, it creates visibility for your activities, products, and services through presence on website, event booth, joint press releases, white papers, and more. 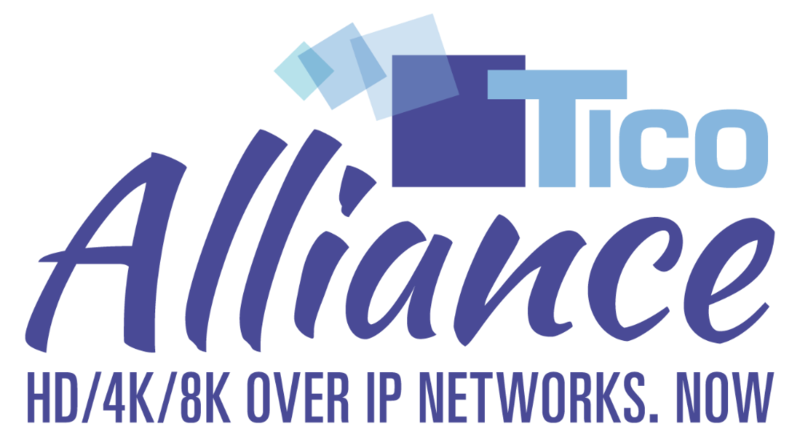 Current members of the TICO Alliance include: Adeas, Aperi, Appear TV, Artel Video Systems, Axon, Blackmagic Design, B&M Modern Media, Barnfind, Bluefish444, CESNET, Cinedeck, Cobalt Digital, Deltacast, Embrionix, EVS Broadcast System, Gefei, Grandbeing, Grass Valley - a Belden brand, Icron, Ikegami, Image Matters, Imagine Communications, Intel, intoPIX, Keisoku Giken, Leader, Matrox Electronic Systems Ltd., Macnica America Inc., MediaComm, Media Links, NEC, Net Insight, Nevion, Panasonic, Pesa, Poznan Supercomputing & Networking Center (PSNC), Pronology, Rhode & Schwarz, Ross Video, Tektronix, Teledyne Lecroy, Telestream, Video Clarity, Village Island and Xilinx.